I have the problem of my beard trying to join up with my eyebrows, yes cheeks that wouldn’t look out of place on a Planet of the Apes extra. I have kept my disposable razor and occasionally I tackle the upward growth but often its just left! I have always fancied using a straight edge razor, but the thought of slicing my face has deterred me and so I have persisted with disposables. Well that was until one of the ‘Guardians of the Beard’ Facebook group admins Jakir posted a Live feed on how to tidy your cheeks and get a good line using a shavette. Now I am going to hold my hands up here, I thought this was a straight edge razor but no, a straight edge is a solid blade and the shavette uses half of a disposable razor blade. Guardians of the Beard member Daniel Lee posted a video and said that he had Shavettes for sale on www.mdmformen.co.uk and that they were now on sale. So I threw caution to the wind and purchased a shavette. When the shavette arrived I put off the cheek shave until the next morning,I was still very worried about using it. I placed the shavette and a small bottle of Mo Bro’s Mango beard oil into a case that came with a Tactical Beards Beard care kit, my grandson gets into everything and I know its more than safe in this case. I sat at the sink (in wheelchair), inserting the blade is very easy, each disposable blade comes in a wax paper and folding this very slim blade snaps it in half. The shavette I have works by sliding the blade holder out and inserting the blade. I wet my beard and applied a small amount of oil to my cheek, my heart had sped up quite a bit and carefully I placed the shavette against my cheek and immediately took it away. You instantly feel how sharp this blade is compared to a disposable razor. Using the recommended 30 degree angle I then ran the razor across my cheek and oh wow, why have I waited this long to use one? I managed to get an amazing straight line on my cheeks, obviously not to barber standards but for me at home and a first attempt, I’m really pleased. I purchased my shavette from Modern Day Man Ltd for a reduced price of £2.99 (was £4.99) plus postage and I recommend this way of shaving, whether its to tidy your cheeks and neck or if you don’t have a beard and are clean shaven. I wish I had used one all those years I spent shaving. Disposable cartridge razor blades are so expensive, they also clog up and we spend ages tapping the razor on the sink to free the blades up. I have seen Wilkinson Sword double edge blades on EBay for £6.50 for 50, that’s 100 blades as you only use half. Guys its time to ditch the expensive razor blades and use a shavette, it feels like a better shave, it will save you money and no clogging. 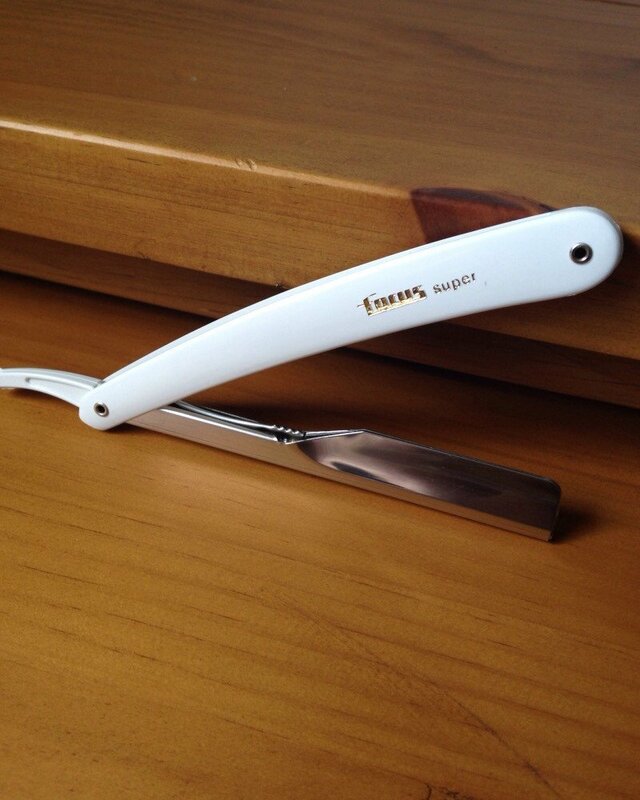 Also it feels rather manly using this style of razor!